A Pole Shed - Large, Economical And Quick To Build. Consider a pole shed if you want a large shed but the cost is a concern. Best used as a barn or storage shed this type of shed can offer many different ways to save the builder money. First a hole is dug down, below the frost zone (which is about 600mm but varies dependant on where you are in the world) for each place that a pole will be set. The pole is then set in the hole. The poles are then aligned and held vertical with temporary props. Then you fill the hole with concrete to about 150mm below ground level. The pole barn framework is then built around these poles. Without a foundation there is no need for a floor. Where a traditional shed might have been built upon a block foundation or have a concrete floor this type utilises the natural dirt floor (A floor of crushed stone, concrete or timber can be added later as and when the budget allows). With no flooring required from the outset, you will also save on building time as well which can be handy if you have to pay for labour (remember to get those volunteers involve in your shed-building project!). Pole barn sheds can come in many different styles as far as the roofing is concerned but the two most common forms are the gable roof and the gambrel roof. The gable roof is one that is most commonly seen on houses, where the roof is made up of two flat sections set at an angle to each other. The gambrel roof is one that is most commonly seen in barns where the both sides of the roof have an additional flat section on each side. See here for pictures of various roof styles. 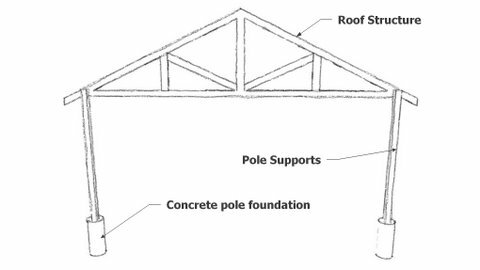 Both of these roof types work very well with a pole barn design in that they can be incorporated in a framework supported by the poles. Another huge benefit to this type of shed is the fact that the inside space can be easily configured to the way that you would like it set up. You can leave a large portion of the shed open for working on different projects and still have a small enclosed section so that you can lock up your tools and equipment. This can be very handy for those who like to work on several projects but still need to keep them separated. The materials and methods used for building this type of shed can save you a good deal of money. It is no co-incidence that cost conscious shed builders such as farmers use pole-shed buildings extensively, as it is one of the most cost effective ways of enclosing a large area. If you will be building a very large pole barn shed then you will of course have to spend more and possibly employ a specialist metal worker to fabricate a steel frame. If your shed is smaller and you can construct your shed from wood then you will be able to save a good deal since you can just use rough cut lumber for the poles and beams. Other savings that you might not have realized are the savings you will find if you choose to assemble your pole barn shed yourself. 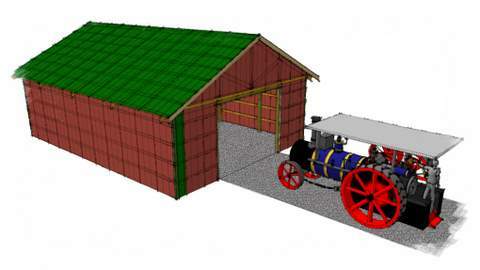 You may also be able to find a polebarn kit that will suit your purposes. 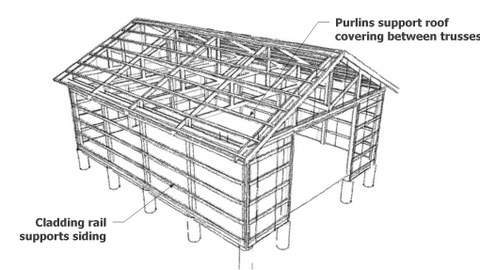 There are pole barn plans available which should include a cutting list so that you can take this to your local timber supplier and have them supply the lumber for you. A pole shed can allow you the freedom to choose how you organise your shed's interior. It can also save you a good deal of money through the lack of a floor other than the bare earth upon which it is built. With a minimum amount of effort to set the poles for support you will soon find that a pole barn shed can more than suit your purposes.